Somewhere on the outskirts of Bangkok along a gravel road just off the main highway, between intermittent groves of coconut trees and rice paddies sits a simple two story dwelling, barely as tall as most single level American homes. The front door is an iron grate and there are a few iron bars but no glass in the windows. The doorway enters into one open and airy room furnished with a few wooden chairs and a small television atop a set of drawers. There's a narrow stairway and a curtain separates the kitchen. A faint stain about three feet from the floor extends around the plaster interior of the home and serves as a constant reminder of the flood two years previous. Otherwise the house is pristine, it's shiny tile floor meticulously swept. And probably about 4 or 5 hours prior to the time I wrote this the elderly woman who lives there would have laid out a thin mat on that floor. As is her custom she likely laid down there, watched a little television, and then fell asleep, perhaps to the faint rumble of fireworks in the city celebrating the king's birthday. She would have just marked one year since the last time she saw her foster son, Adithep. One year since she tearfully implored the large American man and his petite wife, via translator, "Please...please take good care of the boy. He is such a good boy!" We of course know him as Adam. And this morning he celebrated the one year anniversary of joining his "forever family" in the manner he has become accustomed to celebrating most mornings. He woke up grumpy, stumbled across the hall, and used the bathroom before getting dressed and slinking out to the kitchen. He demanded Cheerios even as the smell of french toast began to permeate the room and then stood underfoot as mom attempted to empty the dishwasher. But after his big sister convinced him of the finer quality of french toast (you get to eat maple syrup with it for goodness sake!) and being allowed to proudly pour his own apple juice, Adam's normal, sunnier disposition returned. By the time I backed out of the driveway he and big sister were happily waving and blowing kisses from the front walk just before piling into the car and heading to school. It can be difficult to notice progress when you are surrounded by it every day. But remembrances of the first day certainly make it clear that the progress is indeed noticeable. Adam is for a variety of reasons, some having to do with the circumstances of his birth and others simply related to adapting to a new hemisphere, about a year behind other kids in terms of his development. But thanks in large part to the labors of my wife he is catching up quickly. I marvel at the manner in which she has patiently taught Adam everything from how to get dressed to when to say "please" and "thank you." She has spent hours at the kitchen table this fall after Alyse leaves for school, helping him learn to say each letter of the alphabet and how to hold a pencil. My relationship with Adam has I think been a bit more difficult. I'm not as patient. And prior to one year ago there had been no significant male presence involved in the first three and a half years of Adam's life. Thus he is having to adjust from no man to six- foot-four oaf-like man with voice three octaves lower than any other human being he had previously encountered. But slowly, mostly by means of Hotwheels and Tonka trucks, we are learning to love one another. He looks forward to our weekly trips to the grocery store together. It seems the more Thai food I learn how to make the better as well. In the interest of equal time Alyse would want me to mention that she is growing up fast also, having now lost both of her front teeth and anxiously awaiting the arrival of their replacements. When I stop and think about my family I am somewhat stunned at how we've been providentially assembled. I can honestly say there is no sense of "loss" or "regret" in not having been able to have biological children of our own. Having adopted both our children has opened new worlds to us, not just geographically although that's been cool too, but spiritually and even theologically. This will likely be my last blog until after the new year, and as advent begins I can't help but wonder what sort of a hot mess Joseph and Mary must have been in the days leading up to the arrival of their son. For all intents and purposes their adopted son. And yet also their savior. While "Mary treasured up all these things pondering them in her heart (Luke 2:19)," surely there must have been supremely awkward times for Joseph. Yet faithfully he marched, leading donkey and expectant wife down the path God placed before him...and what wonders he was privileged to witness. I marvel at the gifts Jo and I have been given, one named Alyse and the other Adam, and the fact that without knowing it they continue to teach us from day to day about such weighty matters as faith, hope, grace, and love. Would I ever have chosen this path? Probably not. But would I change it? Definitely not. 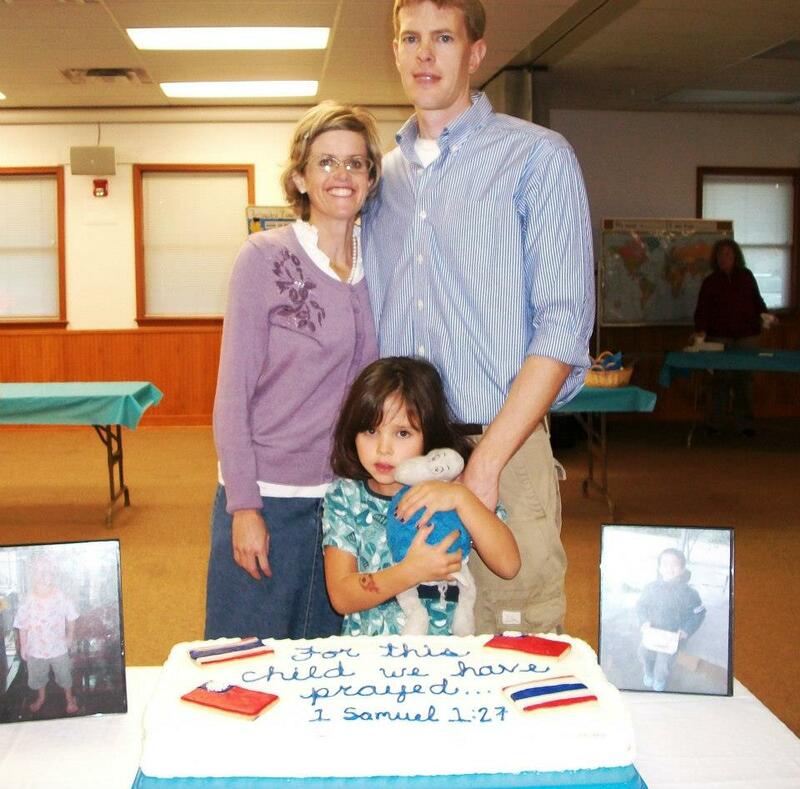 *Because I know some are going to ask, "Why no photo of Adam with the family?" Well, it's because one year later we are still waiting upon some documentation from Thailand in order to officially complete the adoption. Until the decree of adoption is completed the Thai government requests no photographs of the child be posted on the internet. Older PostThanksgiving is Almost Here!